« Ten things you can do to help bees! Many people have a deep seated fear of insect stings, whether it is from a bee or a wasp, they suspect deep pain followed by a near death experience, or worse, and I guess for a very small group people this could be a reality. However there are only about 4 anaphylactic related deaths in the UK each year so it really is very unlikely to be you! Like most bee keepers I expect to get stung occasionally, and I do, mainly in the hands or lower arms and I get very little pain, the sting itself is removed reasonably quickly and I do not tend to have much of a reaction at all, not even the normal swelling, redness or itching that most people experience. However recently following an apiary meeting with the Kent Beekeepers Association, I was enjoying a cup of tea and a slice of cake at the apiary when a bee decided to smack me one of the upper lip. Due to the location of the sting and not being able to see beyond my nose and through my stubble it took about 2 minutes to remove the stinger so I got a reasonable amount of venom injected which led to my transformation into the elephant man. The photos show that the immediate response to the venom was for my upper lip to ballon, and keep going, and going. The lip then started to deflate but the reaction moved up my face with swelling in my right cheek and under both of my eyes. 26 hours to 72 hours after being stung! 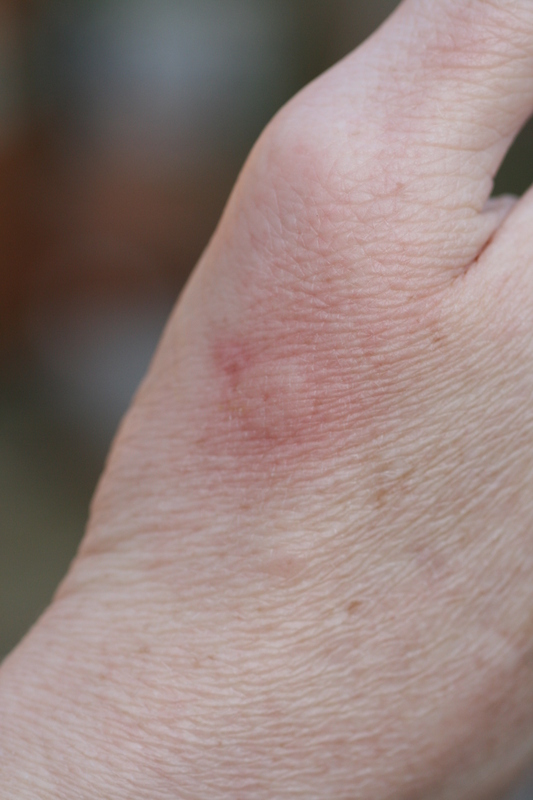 The reaction to the sting was still quite evident in my face, even after three days. There was no pain or itchiness with this, on the second day my gums felt numb as if I had been to the dentist but this soon passed over and I soon forgot about the way I was looking although I was reminded on a regular basis by everyone that I met! sorry about the bee sting and glad to hear that there was no itching or pain but it was entertaining never the less. Glad its all over now.